The hex hatch has begun on Lake Almanor but it hasn't quite peaked yet. I was lucky enough to get up to the lake and do an overnight trip to catch the hatch but was left fishless along with the majority of the anglers there. I talked to the few anglers who were catching fish and they said they were dragging the bottom with a type 2 and type 4 sink-tip with the latter catching the most and biggest fish. Both anglers had been on the lake for a couple of nights so they were keyed in on what was working and what wasn't. Getting your nymphs down with no retrieve seem to be the ticket. I was using a Teeny-200 but I was retrieving so I wasn't successful. The hex hatch can be a hit or miss depending on the night making it a tough hatch to fish for a simple overnighter. If I could have had one more night I probably would have been successful but keeping the AC running is kind of important. It was fun to watch the bugs come out as well as beat the Valley heat but it would have been more fun to hook a few fish. 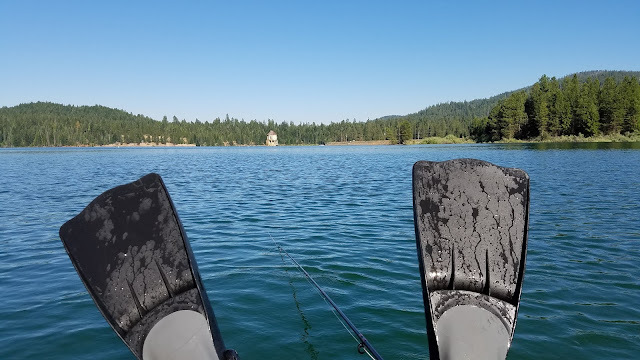 I'm not too disappointed about Lake Almanor whereas I have a few nights fishing and camping at a place I have yet to experience, the legendary Manzanita Lake.